There is a lot happening underground that you’ll never know about unless you explore the caverns at Ruby Falls. The trails into the caverns will take you down to a 145-foot underground waterfall that you just have to see to believe. On Friday nights, there are lantern tours throughout the caverns. If the water turns hot and there is no swimming pool around, then the water fountains at Coolidge Park are just the thing to cool everyone off. Bring your swimsuits, pack a picnic and make a day of it. Does everyone in your family bike? Then the paths along the Tennessee Riverpark at where you should be pedaling. If you don’t feel like loading up the bikes, then you can rent some and take in the eight miles of paved bike paths. Great scenery around every bend. You don’t need to put on scuba gear to go under the sea. At the Tennessee Aquarium, you’ll be able to explore all kinds or marine life along with macaw and penguins. There is also two-hour guided river excursion from the Chattanooga Pier on board the River Gorge Explorer. Every kid loves a train and at this museum, you’ll see a lot of them. There is plenty of history to take in before you climb about an actual operating steam train for a one-hour trip. It’s a terrific way to see the countryside. You’ll enjoy the fun adventures ahead if you can come home to house that is free of junk. Don’t take up your spring break handling that junk hauling task you’ve been putting off. Give that to Junk King Chattanooga instead. 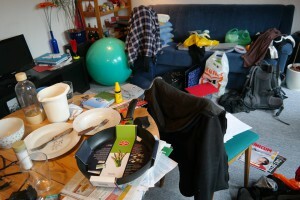 Try to visualize all the things you want to get rid of. Now imagine them gone from your home from good. Junk King Chattanooga can make that happen on this spring break. This entry was posted in Chattanooga Junk Removal and tagged Junk King, junk removal, spring break on March 31, 2018 by Junk King. Last updated March 31, 2018 . Get a jump on your Chattanooga Spring Clean – Haul that Junk!